Two nights ago I braved the bitterly cold weather to check the mail. When I got outside, I looked up into a midnight blue sky, crystal clear in the cold air with stars shimmering brightly, and immediately saw a meteor disintegrate in the upper atmosphere. I remembered then that it was about the time of the Germinid meteor shower. I craned my neck back hoping to catch sight of another meteor, but that was it, the only one I saw. I was too cold to stand out there looking any longer. I ran to the mailbox, grabbed the mail, and came back into the warm house, stamping the cold out of my feet. Looking up into that night sky reminded me of the sense of wonder that I felt when I looked up into a similar sky three decades earlier and realized for the first time that those lights in the sky I was seeing were actually distant suns, and that some of them were even planets. I was six or seven at the time. My parents bought me a telescope and I frustrated the librarians of the Franklin Township Public Library by repeatedly checking out the same book over and over again, The Nine Planets by Franklyn Mansfield Branley. It was my introduction to science. I never learned about the Germinid meteor shower in any of my schooling. Instead, I learned about it and about meteor showers in general through Isaac Asimov’s science essays that appeared monthly in The Magazine of Fantasy & Science Fiction. 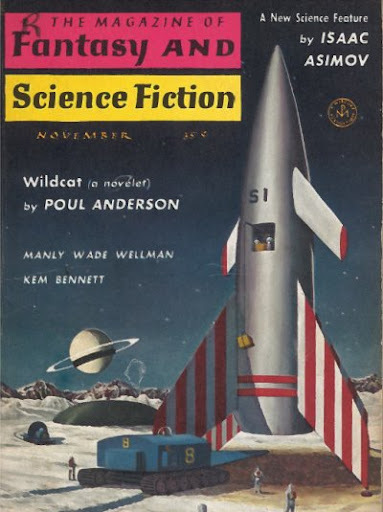 The first of Asimov’s science essays appeared in the November 1958 issue (of which I happen to posses a copy). Those monthly science columns continued unabated for 399 consecutive months. (And eventually, Isaac’s wife, Janet, put together a 400th column after his death.) The essays were collected in more than two dozen books. The columns themselves ranged through all realms of science, and occasionally into philosophy and humanities. They were written in Asimov’s familiar colloquial style, making it easy for anyone to approach even arcane subjects. I devoured every one of those essays and it is from those essays that I truly believe that I learned nearly everything I know about science today. Don’t get me wrong: I did learn some science in school. Prior to junior high school, I have little memory of any specific science lessons. In high school, I took AP biology, chemistry (for some reason the AP version was not offered), and AP physics. In biology, I learned about things like the Krebs cycle and the basics of genetics and inheritance, and cellular anatomy. This was essentially rote memorization and despite being an “advanced placement” class, I was more or less taking the teacher’s word on these things. From Isaac Asimov, I learned much more. I learned, for instance, how the Krebs cycle was discovered, which fixed it much more clearly in my mind. I learned the fascinating story of Gregor Mendel and how he discovered the laws of inheritance and how they were then lost to science for another generation. In high school chemistry (and later, in college general and organic chemistry), I memorized the periodic table and was taught how to balance chemical formulas. Isaac Asimov taught me how Dmitri Mendeleev developed the period table and how he predicted the properties of elements long before they were ever discovered. The insights this gave me into chemistry went far beyond anything I learned in my formal classes. In his essay “Life’s Bottleneck” (F&SF, April 1959) he taught me biochemistry in a way that showed the precarious balance of nature and how remarkable it was that just the right conditions existed to support life. I grew to love physics when I took AP physics in high school with Dr. Goldman, who was one of the few good explainers of science I’ve run into. Still, while I learned equations for light and magnetism in his class, Isaac Asimov made such subjects come to life in a practical way for me with essays like “The Bridge of the Gods” (F&SF, March 1975) about rainbows, refraction and light, and his essay “Four Hundred Octaves” (F&SF, June 1982) on the physics of light. He was the Great Explainer and it was from essays like “The Man Who Massed the Earth” (F&SF, September 1969) that I learned that science was a continually evolving thing. It’s one thing to learn that the Earth weighs 5.9×10^24 kilograms. It’s something else to learn just how scientists figured that out. The former I learned in school; the latter I learned from Isaac Asimov. Asimov’s essays taught me not only the hows and whys of science, they taught me the history of science. Taken together, anyone who reads all 399 F&SF science essays can’t miss certain patterns in logic and reasoning, can’t miss the evolution of thought and experiment. The essays taught me that scientists were real men and women. Essays like “The Isaac Winner’s” (July 1963) highlighted the triumphs of some of the most remarkable scientists of all time. Other essays taught me that even scientists can make mistakes, can be wrong, and that a whole premise of the scientific method is to look for holes in theories, and to revise hypotheses as new data is accumulated. Occasionally, Asimov’s science essayed ventured into the truly remarkable (in my opinion). His essay, “I’m Looking Over a Four-Leaf Clover” (F&SF, September 1966) was a remarkably original (at the time) approach to cosmology. His essays like “The Height of Up” (F&SF, October 1959) looked at how far away things could be and asked if there were limits. He had other essays that looked at the smallest possible sizes, or the hottest possible temperature. His essays on math and numbers fixed certain concepts more firmly in my mind than any trigonometry or algebra class ever did. His essay “Exclamation Point!” (F&SF, 1965) taught me factorials in a far better way than any of my math teachers. Essays like “The Ultimate Split of the Second” and “The Week Excuse” (F&SF, June 1972) taught me about time and calendars in an original an vivid way. Sometimes, Asimov’s essays ventured out from the realm of pure science and in most of these cases, the results were among some of the best nonfiction writing I’ve encountered. His essay “Thinking About Thinking” (F&SF, January 1975) talked about the value (or lack thereof) of intelligence tests. His essay, “Crowded!” introduced me to the population problem. And one of his most remarkable essays, “The Ancient and the Ultimate” (F&SF, January 1973) looked at the evolution of books. Reading his essays on quasars and lunar eclipses and the tallest mountains and longest rivers sparked my imagination and my sense of wonder about the universe and probably have as much to do with my love of science fiction as his science fiction does. It was from Isaac Asimov that I learned things like the square-cube law, transfinite math, and compound math, things never covered in any of my high school textbooks. Today, only a few of these essays are truly dated. Some facts have changed because science evolves, but the core is still valid and the history that these essays provides is an invaluable tool for understanding the cumulative nature of science. Seven of these early essays were never put into any collections, and there were six or seven that Asimov wrote before his death that have not, to my knowledge, been collected either. Perhaps I am a lone voice in the wilderness here, but I think it’s high time that a newly reissued compendium of all of Isaac Asimov’s F&SF science essays be put together and re-released. There is an audience of millions of school-aged children who are not getting adequate science educations out there and such a reissue could provide them (especially those curious ones) the additional nourishment they are lacking. And besides, there are any number of adults who might be interested in such a reissue as well. There are some good science writers out there today, but none of them, in my opinion, come close to capturing full sweep of science, history, and sense of wonder that the Good Doctor did for more than thirty years in his essays in F&SF. When I say that I learned nearly everything I know about science from Isaac Asimov, I am not kidding. Shouldn’t we make this knowledge available to kids (and grownups) today? Amen! I read The Good Doctor’s fiction starting at age 9 and at 16 bathed in the science essays. My career in computing is fully and uniquely ascribable to Asimov’s work.